A bar owner in Pennsylvania is in hot water after hanging up decorations that depict a black man being hung. 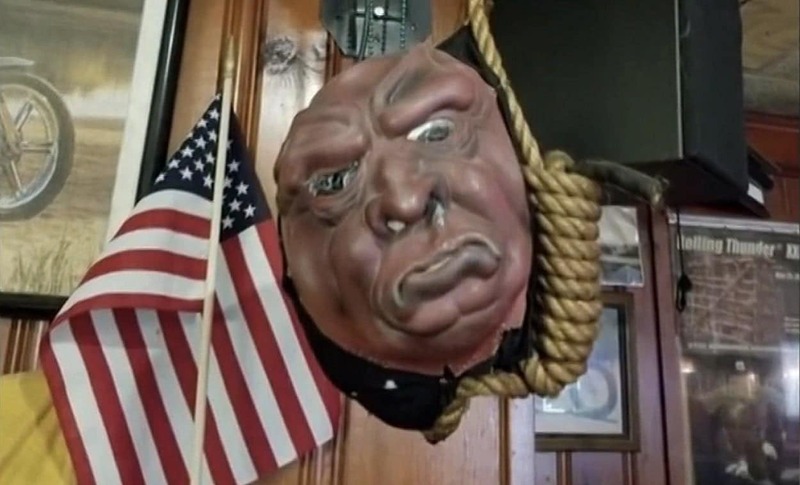 According to WPXI, Skip Riggle, the owner of Kickstand Restaurant is Elizabeth, Pa., claims that allegations of racism are completely unfounded because he put up a Halloween display showing what was supposed to be the devil hanging from a noose – not a black person. Photos and images of the mask in question went viral on Twitter, Facebook and Reddit with the overall consensus being that the establishment’s explanation was disingenuous. Members of the community have posted on social media that they plan to boycott the restaurant because Riggle is in denial about being a racist. And one Facebook user said she walked out without paying her check after she saw what was hanging at the bar. “I can’t change their mind. You believe what you want to believe. I’m telling you the truth,” Riggle said.